Strong validation Each public proxy server is tested against bandwidth, reliability and anonymity. The validation is continuous and each public proxy server is validated every 15mn. Most suitable proxy choice For each request, the most available proxy server is used, depending on its current use count and bandwidth. Continuous validation After each request, information for public proxy server reliability is updated. Trust adjustment Each proxy server has a trust note, based on its availability and detection heuristics. Proxy servers with higher trust are used in priority. HTTP and SOCKS Proxymizer uses HTTP in GET and CONNECT mode (also known as HTTP tunneling) and SOCKS public proxy servers. HTTP proxy Proxymizer entry point is an HTTP proxy, allowing simple GET queries or HTTP tunneling. Web interface All configuration and information goes through a nice and yellow (just like this website) web interface. 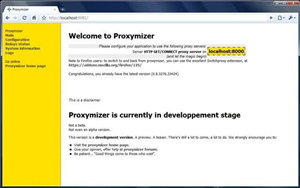 Runs as a system service Proxymizer starts with the system, not with the user, so it can be integrated on a local server. Your private life is private again!